After my success in building two different versions of a propane fueled gas turbine engine, I want to take the next step and build a more powerful liquid fueled engine. This is going to require a nearly complete rebuild of the engine. I don't think my present improvised combustor and flame holder can be adapted for use with liquid fuel. They are just too narrow in diameter. Liquid fuel needs to be sprayed out in a cone and mixed thoroughly with the air for good combustion. In the present chamber, the liquid would impinge on the inside of the flame holder before it could mix properly with the air and burn fully. This just won't work. I also want to reorient the combustion chamber so that it is vertically above the turbine, and not below it as it is now. This is so that the liquid fuel won't be able to pool in the chamber and possibly cause a runaway situation. Rebuilding the combustion chamber will require rebuilding almost everything else, so it will essentially be an all new engine when I am done. That's why I call this "A New Beginning." Unfortunately, I don't have the time to devote to this hobby that I had been in the past. I have too many other irons in the fire right now and I suspect this rebuild will be very slow going. Progress will be very slow as time to work on the engine will be hard to come by. My first step down the road to liquid fuel was to buy a variety of spray nozzles from McMaster Carr. I bought a wide variety of flow rate nozzles since I'm not sure at this stage just what flow rate will be best. I hooked them up to my garden hose and measured the diameter of the spray cone they produce. I decided that the internal diameter of the new flame holder should be at least 4 inches, and a little more if possible, to allow for complete atomization and mixing of the fuel with the air. Naturally this means that the outer shell of the combustion chamber must be even larger to allow for air flow around the flame holder. Next I needed a rough idea of how long the combustion chamber should be to allow complete combustion of the fuel in the chamber and prevent the flame from impinging on the turbine. So I scrounged up an old fuel pump and pumped odorless mineral spirits (I figured it was fairly close to kerosine, I also already had a lot of it on hand.) through my spray nozzles at about 40 psi and ignited it. The result was an impressive torch. I'm sure the neighbors thought I was nuts. Too bad I didn't think to take any pictures. Anyway, I measured the length of the flame and it looked to me like the combustion chamber needs to be at least 7 to 8 inches in length to ensure complete combustion. A little longer probably wouldn't hurt. be the outer shell of the combustor. The tubing will be the flame holder. the diameter of the turbine inlet. The other part will be discussed later. Armed with these figures, I headed out to a local salvage yard and sorted through the bins of stainless steel scrap. I found some interesting bits that looked like they would make a nice combustion chamber and flame holder and bought them. Sorry but I don't remember what I paid for them, but I do remember feeling over charged. However, the one piece I plan on using for the combustion chamber is so perfect that I would have payed much more for it. The primo piece I found was a flanged stainless steel can that was almost made to order for my application. I have no idea what it was originally, but it will make a great combustion chamber. It is 5.5 inches in diameter and 12 inches long. The next find was a piece of stainless steel tubing 4.5 inches in diameter. It is really heavy walled stuff. I would have liked to find some thinner walled tubing, but there wasn't any to be found. I grabbed it just in case but will keep my eyes open in the future for something thinner and easier to work with. 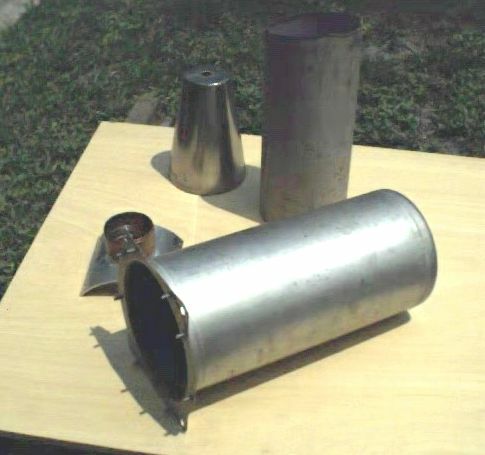 I also found a stainless steel cone that would work as a reducer down to the diameter of the turbine inlet. Two real jet engine spark plugs bought on eBay for only $5.00! I am planning on fueling the new engine with either kerosine or diesel fuel. I strongly suspect that an ordinary spark plug won't be able to ignite the fuel reliably. I was working on alternative ideas when I noticed real live jet engine spark plugs for sale on eBay. I put in a bid on a pair and won! The best part is that they only cost $5.00! With shipping they still came in under $10! 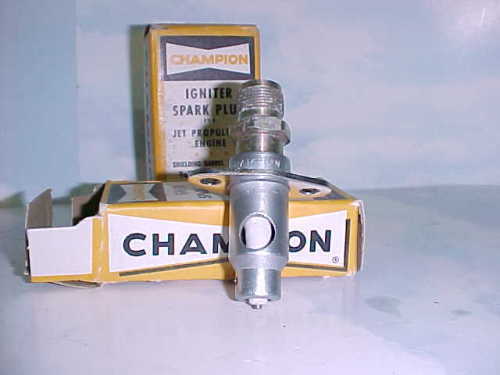 They are Champion FS-31 plugs originally intended for use in the F-86. I got a pair of new unused plugs in the original boxes. Although these are clearly 50s era spares that sat on a shelf somewhere until somebody decided to dump them, they seem to be in absolute mint condition. I figure I can use a neon sign transformer to blast a super hot spark across the gap on these plugs and reliably ignite the fuel air mix. Or maybe I will get lucky and eventually locate a spark generator for a real jet engine too, maybe also on eBay. eBay is amazing. Literally everything on Earth comes up for sale there eventually. There are usually lots of parts for real jet engines for sale there, and occasionally even whole working jet engines. There are also lots of other neat parts like turbochargers, fuel pumps, oil pumps, books, manuals, etc. I check it often.